- 10 tableau piles - build down regardless of suit, or in the same rank. Groups of cards in sequence down in suit (or of the same rank) may be moved as a unit (groups moved as a unit cannot contain both cards descending in sequence and multiple cards of the same rank at the same time). A space can be filled by any card or legal group of cards. At the start of the game 6 cards each are dealt to the first 4 piles, 5 cards each to the remaining piles. The top card is face up. - stock (top left, face down) - deals 1 card to each tableau pile by clicking. All tableau piles must be filled before dealing. - 13 tableau piles - build down in suit, or in the same rank. Groups of cards in sequence down in suit (or of the same rank) may be moved as a unit (groups moved as a unit cannot contain both cards descending in sequence and multiple cards of the same rank at the same time). 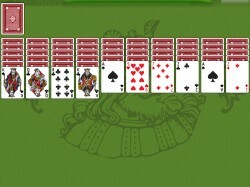 Spaces are filled by a King or a legal group of cards headed with a King. At the start of the game 4 cards are dealt to each pile.